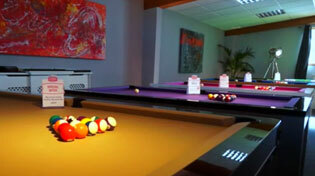 Home Leisure Direct carries a great range of Jump and Break cues. In stock now for free delivery to the UK. Jump and break cues are specialised cues for particular pool shots, and so differ from standard cues in important ways. Jump cues are traditionally shorter than standard pool cues to allow for maximum control. A shorter cue means you can more easily angle it to get the tip under the ball, giving you the jump you need to reach tricky shots. Jumping the ball is a key technique and can change the flow of the game entirely, so having a specialised jump shot cue is a necessity for anyone who takes their game seriously. Break cues are made with harder tips and ferrules, as they are used for harder break shots as opposed to the more controlled mid-game shots. A hard break is important to get the game started, so specialised break cues are made to be more robust and give you maximum impact. All of our jump and break cues come with free delivery to mainland UK. However, for locations outside the UK mainland there may be an additional charge depending upon your exact location. Please call our friendly customer service team on 0800 622 6464 for a quote.